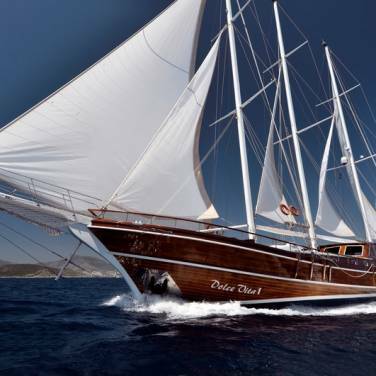 Gulet Charter Croatia - gulets for cruise Croatia are beautiful wooden cruising yachts available for charter and private cruise on the Adriatic. 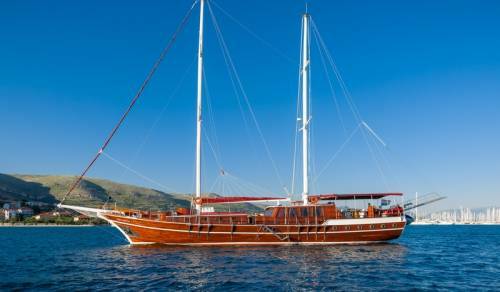 Gulet rental is one of the most unique and authentic ways to experience the cruising holidays in Croatia. 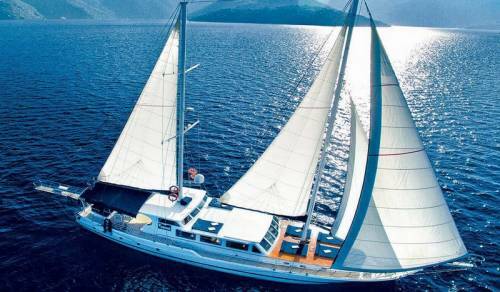 In fact, very few sailing experiences can be compared to that of a gulet charter, offering you a marvelous blend of modern-day comforts and the charms of tradition. Explore the sun-soaked beaches of the magnificent Adriatic coast or go island-hopping around the gorgeous Croatian islands in total privacy and style. Depending on the number of guests and your preferences, you can choose between 3 to 8 cabin gulets, providing accommodation for up to 16 charter guests. Our wide selection of cruising gulets for charter in Croatia will help you find a sailing gulet that fits your needs and budget and matches your ideal Croatian gulet cruise.Hand-crafted of mahogany, pine and teak, gulets possess a refined elegance that sets them apart from standard charter yachts. Encompassing the most indulgent cruising experiences, gulets offer the perfect cruising holiday amidst Croatia’s exceptional scenery and intriguing cultural sites. 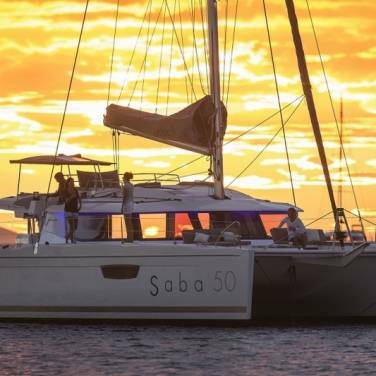 Spacious sun decks, air-conditioned en suite cabins and comfortable lounge and living areas make gulets a quintessential choice for private cruising holidays with family or friends as well as corporate cruises, incentive programs and other special occasions such as weddings or anniversaries. 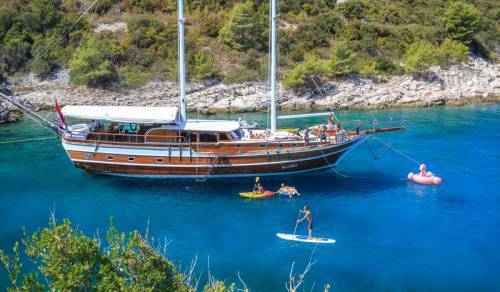 Swimming and sunbathing are the favorite pastimes of guests who opt for a gulet cruise in Croatia. However, there is a variety of water sports equipment available on board as well, from water skis, Jet Ski, canoes to snorkeling and fishing gear.Gulet cruises also entail tailor-made sailing itineraries, which include some of the most compelling cruising destinations in Croatia, such as Split, Dubrovnik and Trogir as well as the breathtaking islands of Hvar, Brac, Vis, Korcula, Mljet and many more. 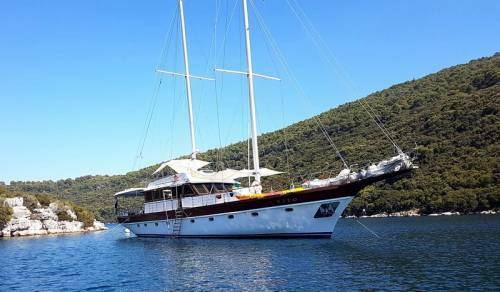 Apart from standard gulet rentals, one-way charters are also available, giving you the opportunity to embark in one port and disembark in another. 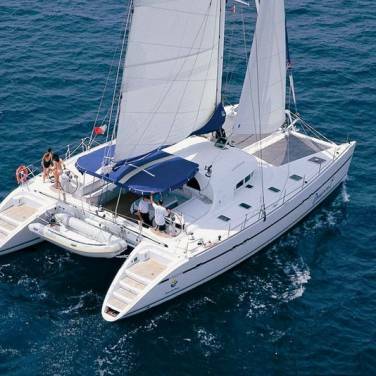 One-way charter arrangements are an excellent choice for those who wish to have extra time to explore all the intimate harbors and anchorages tucked away on the shores of Dalmatia, Kvarner and Istria. 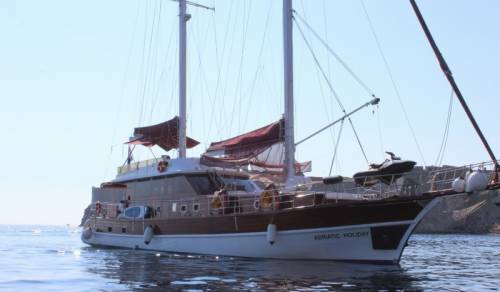 An imminent part of any gulet cruise is the full-time, professional crew, committed to offering an outstanding charter service during the entire course of the cruise. The crew consists of a captain, a chef and a sailor; however, additional crew members may be required on some bigger boats. Since exceptional service is the ultimate goal on gulet cruises, it is important to know that all crew members are carefully selected and have years of previous charter experience. Although constantly at clients’ disposal, the crew have their own sleeping arrangements, enabling guests to enjoy their privacy while on board. Consistent with its reputation for fine onboard dining experiences, gulet charter in Croatia gives you the possibility to relish the indigenous Dalmatian recipes infused with elements of the Mediterranean cuisine and further complemented with wonderful regional wines. With a patchwork of fascinating landscapes, remnants of ancient civilization and harbors of unbridled charms, gulet cruises in Croatia provide infinite possibilities for an unforgettable charter vacation.